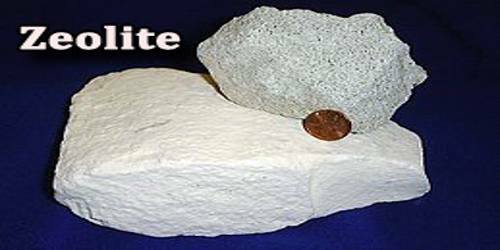 Zeolite is any of a family of hydrous aluminum silicate minerals, whose molecules enclose cations of sodium, potassium, calcium, strontium, or barium. 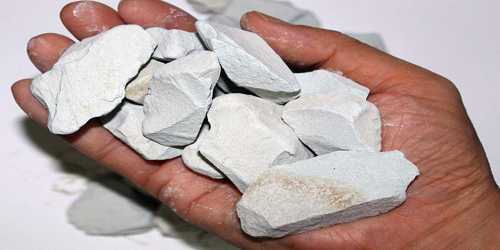 Zeolites are usually white or colorless, but they can also be red or yellow. They are characterized by their easy and reversible loss of water of hydration. They usually occur within cavities in basalt. The term zeolite was originally coined in 1756 by Swedish mineralogist Axel Fredrik Cronstedt, who observed that rapidly heating the material, believed to have been stilbite, produced large amounts of steam from water that had been adsorbed by the material. The zeolitic channels (or pores) are microscopically small, and in fact, have molecular size dimensions such that they are often termed “molecular sieves”. The size and shape of the channels have extraordinary effects on the properties of these materials for adsorption processes, and this property leads to their use in separation processes. Molecules can be separated via shape and size effects related to their possible orientation in the pore, or by differences in strength of adsorption. The principal geologic settings of zeolites are (1) saline, alkaline lakes, (2) saline, alkaline soils, (3) deep-sea sediments, (4) low-temperature open hydrologic systems, (5) burial diagenesis, and (6) hydrothermal-geothermal systems. Volcanic ash layers alter rapidly to zeolites in saline, alkaline lakes, and relatively pure deposits can be formed. Silicic volcanic glass is altered slowly, and principally to smectite, in deposits of moderately saline, nonalkaline lakes, as demonstrated in sediments of Searles Lake, California. Vitric tuffs in saline, alkaline playa-lake complexes are characteristically zoned from an outer fresh-water zone with unaltered glass or glass altered to smectite, an inner saline zone with zeolites, and an innermost highly saline zone with analcime and/or alkali feldspar, most commonly K-feldspar. Large-scale zoning of saline, alkaline type is exhibited by the Upper Jurassic Morrison Formation in the San Juan Basin, New Mexico and Arizona. Since silicon typically exits in a 4+ oxidation state, the silicon-oxygen tetrahedra are electrically neutral. However, in zeolites, aluminum typically exists in the 3+ oxidation state so that aluminum-oxygen tetrahedra form centers that are electrically deficient one electron. Thus, zeolite frameworks are typically anionic, and charge compensating cations populate the pores to maintain electrical neutrality. These cations can participate in ion-exchange processes, and this yields some important properties for zeolites. When charge compensating cations are “soft” cations such as sodium, zeolites are excellent water softeners because they can pick up the “hard” magnesium and calcium cations in water leaving behind the soft cations. When the zeolitic cations are protons, the zeolite becomes a strong solid acid. Such solid acids form the foundations of zeolite catalysis applications including the important fluidized bed cat-cracking refinery process. Other types of reactive metal cations can also populate the pores to form catalytic materials with unique properties. Thus, zeolites are also commonly used in catalytic operations and catalysis with zeolites is often called “shape-selective catalysis”. 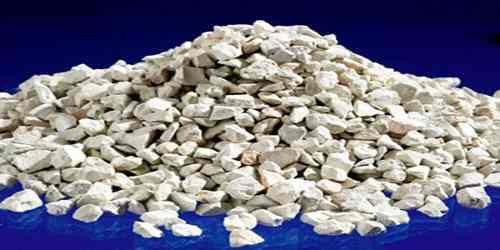 As of 2016 the world’s annual production of natural zeolite approximates 3 million tonnes. Major producers in 2010 included China (2 million tonnes), South Korea (210,000 t), Japan (150,000 t), Jordan (140,000 t), Turkey (100,000 t) Slovakia (85,000 t) and the United States (59,000 t). Zeolites have a porous structure that can accommodate a wide variety of cations, such as Na+, K+, Ca2+, Mg2+ and others. These positive ions are rather loosely held and can readily be exchanged for others in a contact solution. 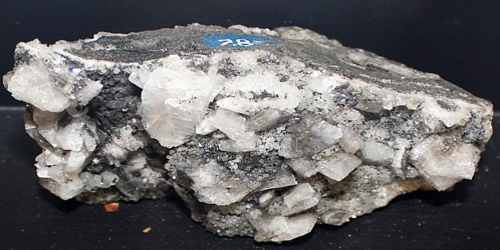 Some of the more common mineral zeolites are analcime, chabazite, clinoptilolite, heulandite, natrolite, phillipsite, and stilbite. There are over 200 synthetic zeolites that have been synthesized by a process of slow crystallization of a silica-alumina gel in the presence of alkalis and organic templates. Many more such structures could theoretically be made. 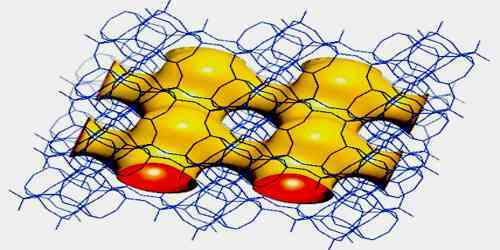 Zeolites are extremely useful as catalysts for several important reactions involving organic molecules. The most important are cracking, isomerisation and hydrocarbon synthesis. Zeolites can promote a diverse range of catalytic reactions including acid-base and metal induced reactions. The reactions can take place within the pores of the zeolite – which allows a greater degree of product control. Hydrated cations within the zeolite pores are bound loosely to the zeolite framework, and can readily exchange with othercations when in aqueous media. Applications of this can be seen in water softening devices, and the use of zeolites in detergents and soaps. It is even possible to remove radioactive ions from contaminated water, as was demonstrated at nuclear accidents at Chernobyl and at Three-Mile Island.